Ohana apartment under private home in nice, safe, comfortable neighborhood. Adjacent lots to house are rain forest. Has one large bedroom which sleeps three (queen and twin). Small screened in lanai. Kitchen w/ fridge, microwave, stove, blender, coffee pot and necessities. Wi-fi and tv w/ cable. Small, but perfect for three people. 500 sq ft. Beach equipment available inc towels. Books and puzzles also available. Carport space. Washing machine and clothesline for drying. Large avocado trees, coconut palms, macadamia nut trees, lychee trees, and loads of flowering plants on property; also pineapples and bananas in yard. Lots of orchids! Only 2 mi to the ocean! Within 30 minutes to Hilo and beaches. Under 40 min to Volcano Nat'l Park. Maku'u Sunday Market only 10 min away. Beautiful scenic drives in Puna area. Occasional little guests (geckos) visit for your enjoyment. Chirping coqui frogs will sing you to sleep! I am a retired school teacher and my wife a retired RN. We love Hawaii, as we had both lived here as children. We found the house before we retired and now frequently come to stay. This property was affordable, although it was a true fixer-upper. Over the years we have put many hours into adding on to the kitchen in the ohana, adding a back porch area, putting in tons of cosmetic work. We love our second home, and our neighborhood and want to share it with you! Puna is a very large area, and you will find the Big Island to be very large indeed compared to the other islands. 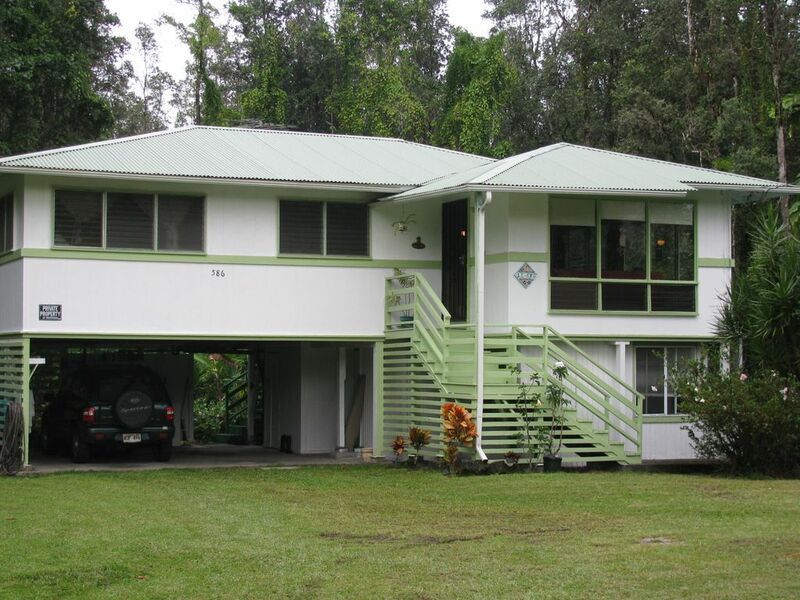 This house is in a good location for seeing the Hilo sights, the Puna sights, and Volcano National Park. Even though the house is located in a neighborhood, because so many lots are undeveloped (rain forestation), one feels they are out in the country. Only four miles up the road is Pahoa with some very good restaurants, groceries, and gasoline. Large space. Has a shower, sink and toilet. Books and puzzles are located in the footstool in living room area. Pahoa has a beautiful Olympic size pool. There is no charge. Adult swim only from 9 am to 11 am. Nice older apt under the house. Fully functional Kitchen. Living area, separate bedroom, large bath. Even has washing machine. Kathy & Rick are very kind! This is a great 1 bedroom, ground floor apartment. I used this home as temporary housing versus a holiday stay, so my review is not your average. Totally affordably priced, given the area. Kathy & Rick are great communicators, and went above and beyond in offering their home and storage for me. I live in Puna, so I know tropical ills are inevitable, although I feel more attention could be paid to the cleaning. City water is available, so no worries about water filters, etc. Pahoa Town is a quick 10min drive away. The home is quiet and surrounding homes/neighbors are quiet. We are happy that the apartment met your needs. Mahalo! We had a lovely stay minus a couple small inconveniences. We appreciate your comments. We are so sorry about the cookware. It will be replaced. Also sorry about the rooster. Hopefully he will find a new "roosting location" soon! Comfortable clean and quiet accommodations. (pfd snorkel reef shoes) are unexpected benefits leaving me inclined to giving a review from our great experience. We are so pleased that you were happy with the accommodations. Thank you for staying at our ohana! Very Humid and Moldy Unit -- needs lighting and furnisher -- flooring too -- updating! We needed more than the ceiling lights to relax in the living room setting. Afew floor lamps with dimmers would be good! The kitchen needs better chairs. Sealing the kitchenware in plastic tubs was not convienient -- although may have been necessary because of attack them otherwise. And, mold was in the bath area -- we always started the fan, but the unit needs a de-humidifer as during our week stay my suitcase started to mold too. We changed bedding midweek as it would not dry enough either. Simple, yes, but located to the Hilo side of the Big Island, so we made do! Best to get adjusted to loud small frogs -- all night long. Thank you for the suggestion for the floor lamps; we will take this into consideration. It is important that the windows stay partially open so that air can circulate. If the apartment is totally closed up then, yes, mildew does develop. Electricity is very expensive on the island; we choose to minimize and not have air conditioning or dehumidification in order to keep the rental cost down. We are sorry that you were not pleased with the ohana, it is important to us that our guests be comfortable while staying here. Altho the furnishings are basic most of our guests have found them to meet their needs. It is not a luxury apartment and the rental price is reflected in this.